DESCRIPTION: The Plus Pack installation kit includes the above roof drain with a cast under-deck clamping ring, PVC pipe extension and EPDM connector with stainless steel clamp bands. Drain construction is a 5" high cast aluminum dome strainer, an 11" diameter cast aluminum epoxy coated gravel guard and clamping ring, an injection molded ultraviolet stabilized PVC drain body, a 6" long schedule 40 drain body extension, a cast aluminum under-deck clamp, and a flexible EPDM connector with stainless steel clamps. 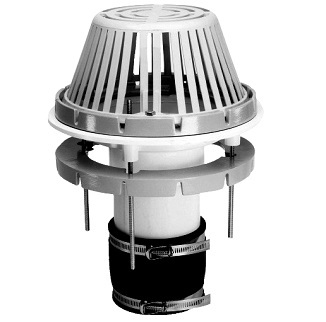 Designed for efficient internal drainage of water from the roof surface. Roof Drains are an effective year-round solution to removing water from the roof surface in all weather and all seasons. Interior Roof Drains have the advantage over gutters and downspouts because interior Roof Drains are maintained at the interior building temperature and are far less likely to freeze and back up in harsh northern climates. With the advent of sloped roof decks and tapered insulations, it has also become necessary to include Overflow Roof Drains to relieve dangerous overloading of the structural system caused by heavy ponding water.